Christmas is just around the corner. Although I don't celebrate Christmas, it is my favourite season of the year. Everything, everywhere looks so cute, colourful and joyous. Aah, the decorations, the trees, the ornaments, the ambiance, everything. Since Christmas is coming, I am thinking aah, why not bake some "colourful" Christmas cookies? I am not good in baking fruit cakes or other Christmas pudding which uses rum and all, so I make what I like - butter cookies, this time, slightly modified ~ with cream cheese and M&M's added. I call it the merry cream cheese M&M's cookies. I am not an expert in baking (nor cooking). 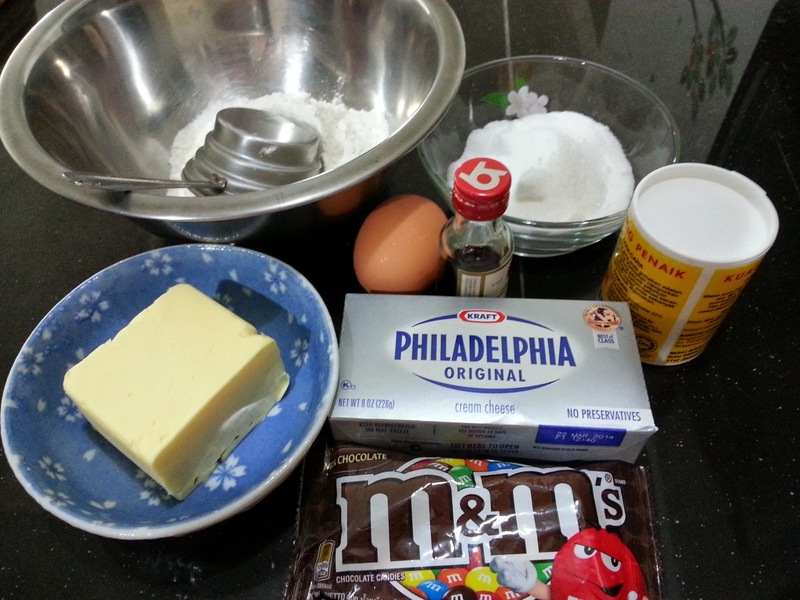 I explain very simply, using simple words, simple ingredients and simple measurement: 2 cups flour, 3/4 cup sugar, 1 egg yolk, 1 block of (Philadelphia) cream cheese, 125g butter, some baking powder, a dash of vanilla essence and M&M's. Beat the wet ingredients, and mix the dry ones in and stir together. Refrigerate for a while so that the dough will be harden a bit, thus, making it easier to manage. I don't have any fancy cookie cutter or what-not, so I just use the spoon to dollop on the baking tray, already lined with parchment paper. Bake at 190 degrees for about half an hour or more, until the cookies brown. *Confession: The dough was a bit "wet", not very firm, thus, it expanded and stuck with each other quite a bit in the oven while baking. Here are my merry cream cheese M&M's cookies, slightly browned (I know). *Actually when I was writing this post, I was contemplating whether or not to post the cookies, coz I feel paiseh as the cookies were not pretty looking and I didn't have that photography skill to "hide" the imperfections. But nah, who cares, I post what I like! Wah! This mummy is so talented! Boleh buat cookies and even cook ABC soup! You should try a few times until perfection before selling them for Christmas and Chinese New Year! I wished that I could bake well and sell them in my blogs. Sure laku one. Eh, you "kor cheong" lor.. I can make very simple stuffs nia.. Like simple cooking (chin tan chau choy), boiling soup (puh-leese, like you dont know how to boil chicken soup) and simple baking (cookies/cakes without frosting)..Canggih ones, sorry, haha..
Eh, serious, if you really bake cookies and sell in your blog, I will be the first one to click "buy"... Even if it's burnt or taste not nice, I will still buy and support you ga..
Let me share a secret with you okay. You should deep freeze the M&M overnight and only place them on the cookies after it has been baked for like 10 minutes in the oven. 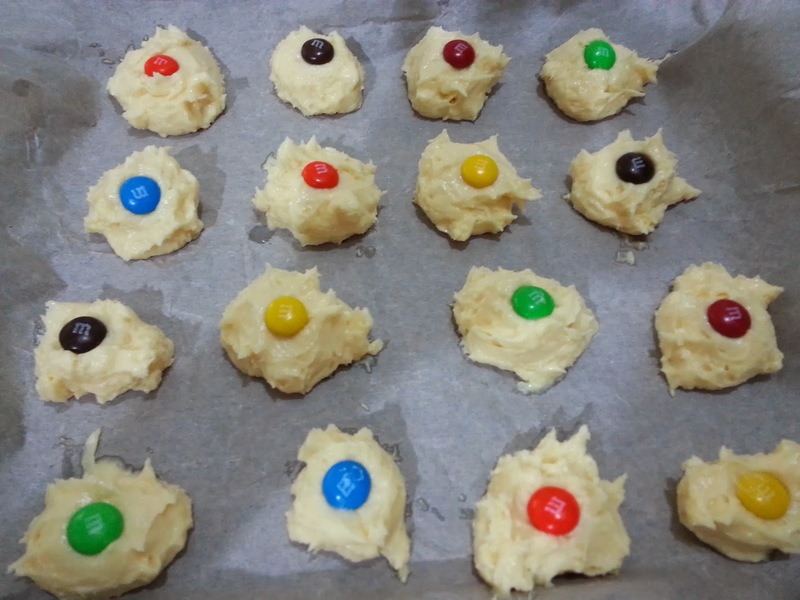 Bring the baking tray out and quickly press the M&M on the cookies before baking again. They will come out perfectly nice and not melted. Good luck! Wah, good secret wor ! I never thought of this, serious. I even took out the M&M's the moment I started mixing the dough together, am I dumb or what? Haha.. Thanks for the tip, I will follow your tip the next time I bake something with M&M's. Not only they melted, they even had a crack in the middle, over-baked kot.. I was trying so hard to put camouflage the imperfections, like inserting cute frames (so that you all would get distracted by it), stamping shiny stars here and there.. Well, like you said, I am me, I am real la, no ka-ka, hehe..
Wah, welcome back SK! How was your trip? I know, stupid question, sure syiok la, kan? Ehhh, ya meh? Very structured meh? Ok, next time I try different structure ok? Maybe follow your style, all in one paragraph, all small letters..
Whoa, I am laughing at your "ended up with a little bit of nonsense".. Wah, me and you memang two same kind of people leh.. No ka-ka, straight forward, I like wor..
OMG you still remembered I fart when I laugh too much... This time no fart wor.. Feel like fart, but actually it's not fart..
merry cream cheese M&M's cookies, wah, the name already attracted me to want to read how this is done.. errr, i am being frank lah, i have eaten the real M&M cookies before (bought from supermarket from M&M itself), a big difference from the look lah, haha.. you only (so kiam siap) put one piece of M&M on each cookie, but the one i had has lots of mini M&M's inside leh.. hahaha!! 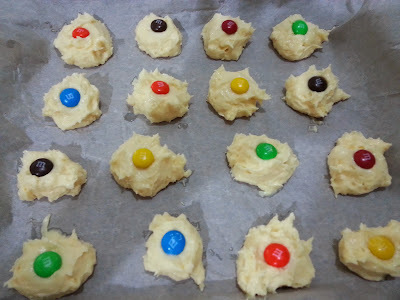 maybe next time try with more mini M&M lah, like that looks more colorful mah..
Wei, I invented this myself lah.. Don't compare with store-bought ones lah.. Ooops, ok, I did not invent this, but I searched the net for simple recipes using cream cheese, just because I have 2 boxes of cream cheese in my fridge.. Cream cheese is not cheap, so I modified the measurement equivalent to one box measurement lor..
Eh, supermarket got M&M's cookies meh? How one? Snap a picture and blog about it lah, share to your readers ma.. As far as I know, M&M's is only chocolates wor.. Got cookies also meh? 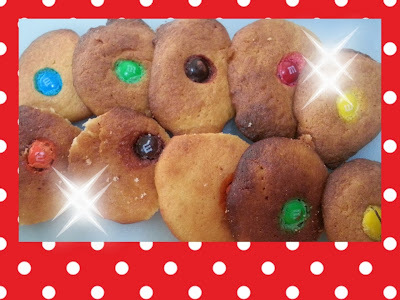 Ehhh, this is basic simple butter cookies leh, but with added cream cheese and M&M's (for deco) only nia... if I can make exactly like what you had in the supermarket, then I no need to work here like a kuli liao, can go become bake expert liao ler..
Ok, the next time I bake, I will use more M&M's to make it more colourful.. It also can hide any flaws on the product surface, kekeke..
got lah, i bought from supermarket.. comes in packet, i think about RM3 a small packet and i blogged about it before.. let me search for it ah.. I just viewed it. Wahlao, really got wor..
You posted in January, that time, I not yet "so into" your blog yet (started stalking already I think).. kekeke... But seriously, I never seen this is the supermarket biscuit section..
Ok, the next time I go shopping for my household stuff and I come across this cookie, I will blog about it also k? Even if it taste not right, but the look is very alright (can tipu orang), I don't think you won't post also, coz you want both the taste+look alright then only you feel ok izzit? Better than me, I am totally dummy when come to baking. Haha. I also love this season. Everyone so relax and lazy at this time. Lol. But I can see you cook well. Western food and all.. I like looking at your cooking post.. Coz I can relate..
Yeah, everyone in the office is clearing leaves and what-not, so the office is very quiet nowadays.. Feeling lazy.. But what to do, still need to come to work.. I remember in my old company when most people on leave me and another colleague "hit mosquito" as totally no phone calls and visitors. We made ourselves occupied with chess board. Lol. Those were the days. wow, that's nice! I love to bake too but very lazy and occupied with work too. Hi wenn, yes I know you love to bake.. I stalked your blog too, remember? I remembered all the cupcakes you made lah.. Haha.. Time to bake something and blog about it liao..
Louiz, first time I see cream cheese as a cookie ingredient. Interesting! I actually prefer browner cookies as they are the ones that are crispy and I like the taste better. I know they don't look as pretty as the lighter ones but who cares? We eat what we like. After all these are authentic home baked cookies. I have two blocks of cream cheese in the fridge, and the expiry date is March 2014. I have planned to use one block for my no-bake lemon cheese cake and another one to try out something new. I am bored of baked (Boston) cheesecake or no-bake lemon cheese cake and what-not, so I googled "cream cheese cookies", and there really IS cream cheese cookies recipe.. So I gave it a try, but let me be honest, I don't follow the measurement in the recipes becoz I only intend to use 1 block of cream cheese, thus, I divide (and reduce and mess up) the measurement until it reaches the measurement that I wanted to make.. So there goes my confession, haha. Yeah, I browned the cookies quite a bit, but so what? The cookies were finished the very next day! I brought half to the office, and it was finished in a few minutes! I think coz it looks colourful la, hehe..